Package bees consist of 3 lbs of honey bees in a cage with a naturally mated Italian or Carniolan queen. We cannot guarantee the queen variety but invite you to list your preference when you order. 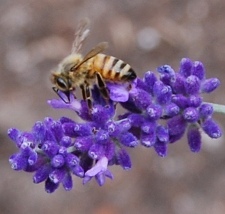 The bees are raised in northern California. Packages are distributed in April. Pick up dates are Thursday April 5th, 2018 or Saturday April 7th, 2018. Options also available to select a marked queen and to have the package pre-treated with Oxalic Acid. 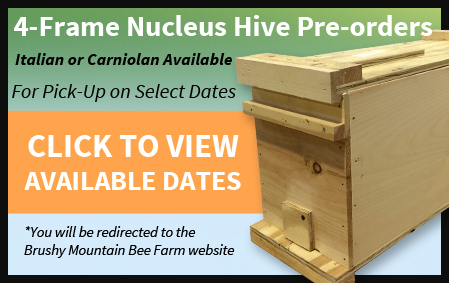 Nucleus Hive: Italian or Carniolan. Nuc Hives consist of 4 or 5 deep frames of honey bees and brood in a wood nuc box. The queen is a young, naturally mated Italian or Carniolan queen that has already been introduced into the hive. Nucleus Hives are raised in Colton, Oregon. Nucs are distributed in April-early May. We cannot guarantee the queen variety but invite you to list your preference when you order. 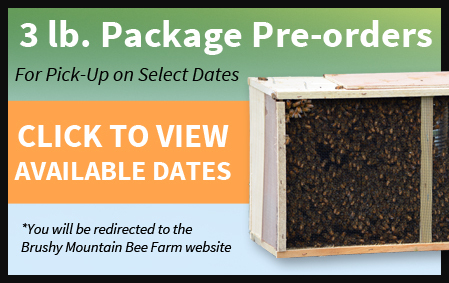 Pick up dates for 4 Frame nucs are: Friday April 13, 20, 27. And Pick up date for 5 Frame nucs is Friday May 4th. Nucs MUST be picked up within the allotted time (7:00 am to noon) on the scheduled pick up day. NO exceptions. Queen bees will be available weekly from approximately April - August except July 3rd. Queens are naturally mated. They come in a 3-hole cage and have attendants and a food supply. Varieties will include California raised Italian, New World Carniolan, and Saskatraz. All are bred for hygienic behavior. Colony behavior can vary significantly from hive to hive. Further, bee behavior can change by selective breeding within the race. 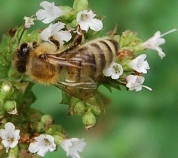 Keep in mind that bee traits you see described on websites and in beekeeping books are often citing the traits of the original stock (from Italy or Slovenia, for example) but these European (old world) bees have been selectively bred in North America (new world) for specific traits since they were first introduced here from Europe. So they might deviate in behavior from the old world stock. The Italian bee is generally described as gentle and productive. We handle thousands of colonies, and we find this to be true. We consider the Italian bee to be great for suburban beekeeping because of its gentle characteristics combined with good honey productivity. The New World Carniolan bee is thought to do well in colder, more mountainous climates. But, in our experience, the New World Carniolan tends to be quicker to defend its hive, so is perhaps less well suited to backyard beekeeping where you have close neighbors. Carniolans also tend to maintain a smaller cluster during the winter, and are late to build up brood in the spring--great traits for mountain foothill bee survival. However, the increase is quick when it happens, which can lead to unexpected swarming early in the season.